Chinese arms firms offered to sell weapons worth about $200 million (Â£124 million) to Col Muammar Gaddafi’s beleaguered forces as recently as July, according to documents found abandoned in the Libyan capital, Tripoli. The Chinese Foreign Ministry on Monday confirmed that Gaddafi representatives visited in July in a bid to buy arms, although it insisted that no contracts were signed and no weapons were shipped. 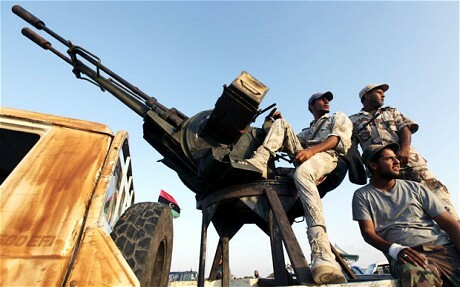 A spokesman said China strictly adheres to a United Nations ban on supplying arms to the Gaddafi regime. “Chinese companies have not provided military products to Libya in any direct or indirect form,” she said. Although there was no indication the Chinese government played a role in the contacts, the fact that the meetings were held is a potential blow to Beijing’s future ties with the Libya’s National Transitional Council. Libya’s interim council has promised rewards for those who took a leading role in backing the revolt against Gaddafi, and that has raised concerns that China could be disadvantaged. China is the world’s second-biggest oil consumer, and last year it obtained three per cent of its imported crude from Libya. Abdel Raham Busim, the rebel military spokesman, said documentation was still being collected and the new government was considering bringing legal action against Beijing, possibly via the UN. Mr Busim said an invoice has been recovered from Libyan government files dating from July that lists $200 million worth of Chinese weapons including pistols, missiles and rocket launchers. He said it was not clear whether any of the weapons had been paid for or shipped, but that other evidence shows Chinese weapons were either shipped to Gaddafi’s forces via Algeria or taken from Algerian stockpiles that China later resupplied. “It is not nice to have enemies. Maybe there could be a way that the situation can be resolved, but that will depend more on the Chinese government,” Mr Busim said. China abstained from the UN resolution authorising force against the Gaddafi regime and has yet to formally recognise the NTC. China and Russia had earlier questioned whether the supplying of weapons to rebels breached the terms of the UN ban. The NTC has in recent days accused Beijing of holding up the release of frozen Libyan funds held overseas, allegedly in order to first guarantee the safety of billions of dollars in Chinese investments in Libya.